For students of comics history, there are few names that strike the ear and the imagination quite like Ditko’s. In a field defined by brilliant oddballs, embittered journeymen, penniless geniuses and colorful hacks, Ditko is the strident hermit king. He gave the world Spider-Man but then more or less bugged out, deciding in 1969 to stop doing interviews and making public appearances. Now 80, Ditko lives in New York City, and although you can track down his studio, nobody I know who’s done so has gotten past the front step. It’s not that Ditko is unfriendly — he’s willing to talk, apparently (in one case, for more than an hour), but only while standing in his doorway, blocking any view into his home and his life. If you’re a journalist, however, it’s a different story. Last year, the BBC aired a documentary, “In Search of Steve Ditko,” in which reporter Jonathan Ross, accompanied by Neil Gaiman, sought an audience with Ditko. He refused to speak on camera, which only reinforces the idea of him as the J.D. Salinger of super-hero comics. This, I suppose, makes Peter Parker a wall-crawling Holden Caulfield. 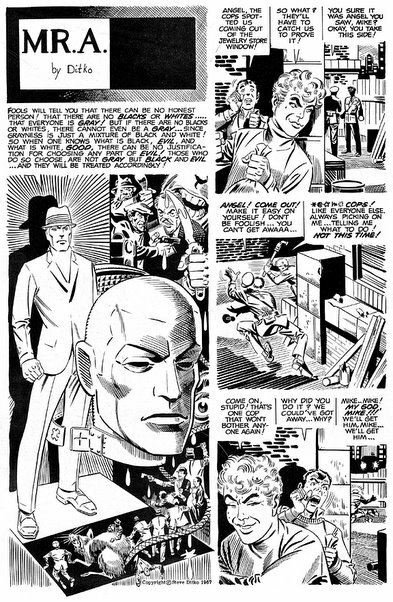 Although Ditko grew up loving the art of Jerry Robinson and Will Eisner, for much of his career, he had a spindly and off-kilter style that rubbed the heroic off the page and replaced it with an odd, anxious ballet of the surreal and the grotesque. The recent Doctor Strange: The Sorcerer Supreme DVD played down Ditko’s “anxious ballet of the surreal and the grotesque” as well as Stan Lee’s impressive-sounding mystic mumbo-jumbo, which always alluded to otherworldly things you assumed someone understood. Ditko is also famous for creating the Question — and infamous for creating Mr. A — which both inspired Alan Moore‘s Rorschach, from The Watchmen . After watching Jonathan Ross ‘In Search of Steve Ditko’, I couldn’t help but research the Secret Origins of Mr. A, the Objectivist hero Ditko created after he left Spider-Man and Dr. Strange behind. Dial B for Blog has the entire five-page first Mr. A story scanned in and online — and, yes, it’s black and white. Ditko is best known for co-creating Spiderman with Stan Lee; Ditko was the artist, Lee the writer. 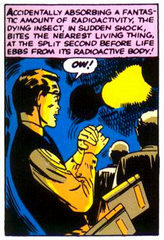 Ditko is also known for creating Dr. Strange, the master of the mystic arts, who travels via astral projection through psychedelic tableaux — which led liberal hippy fans to embrace the politically conservative Ditko as a Leary-like guru. Where things get particularly odd is when Ditko leaves Marvel to create independent comics featuring his own crazy brand of Rand’s Objectivism. The Question is a bit odd, but Mr. A? Wow. I’ve been meaning to pick up Marvel Visionaries: Steve Ditko for some time now. I suppose I should really pick up the 1088-page Amazing Spider-Man Omnibus, which includes the entire Ditko run. It’s a shame that the Essential Doctor Strange doesn’t come in color. Sixties hipsters thought that Ditko’s urban realism and trippy visions meant that he was one of them. They couldn’t have been much more wrong. 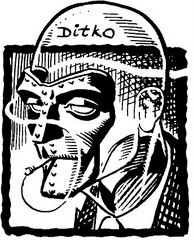 Around the time that Ditko fell out with Marvel Comics in 1966, he became fascinated with Ayn Rand and objectivism, and his work started to take on a severe and increasingly strident right-wing tone. He spent a few years working for the small company Charlton Comics, where his most significant creation was the Question: a hero in a suit, hat and tie, with no face — just a blank pink blot — and a ruthless contempt for moral relativism. At a subsequent stint with DC Comics, he created the Hawk and the Dove (a pair of superhero brothers, whose personalities were exactly what you’d guess) and the Creeper (a yellow-skinned, green-haired, red-maned, screeching maniac).